This week’s Rate the Dress takes us from ballrooms, to bedrooms, with an formal dressing gown that I’ve dithered over showing to you for weeks, because what will you make of what is essentially a really, really, fancy bathrobe? It was a fairytale ending for the 1860s ballgown, with everyone singing its praises and declaring it must have been made by a fairy godmother, because if there was ever a historically accurate Cinderella ballgown, that was it! (with a few votes for Elsa). Almost perfect! (and really, that’s pretty much as close to perfection as RTD is likely to get). 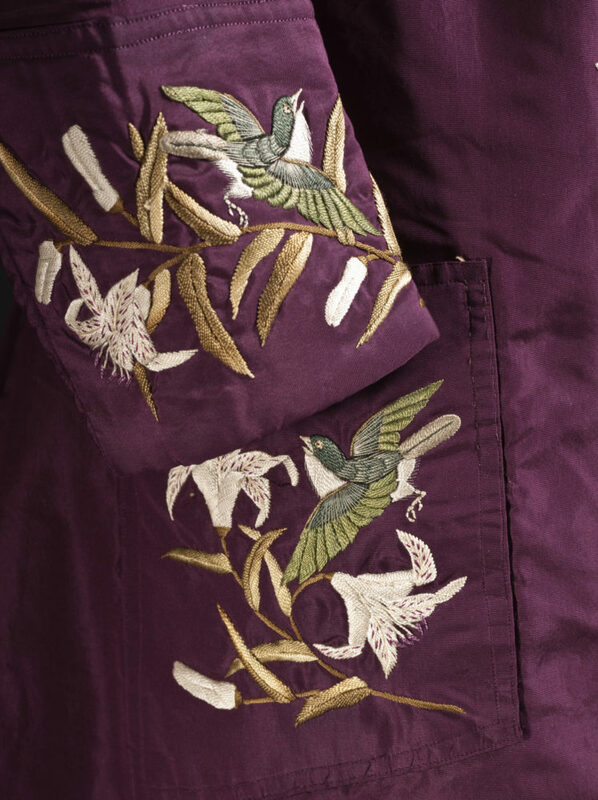 This embroidered dressing gown is a fantastic example of the type of goods that were made in Japan for the Western market. 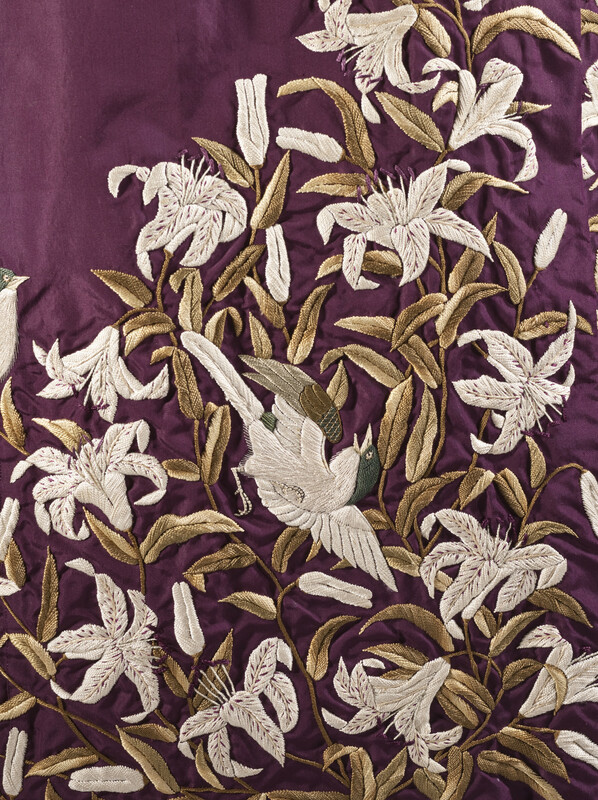 It features lavish embroidery that combines both a Japanese and Western aesthetic. Although there is a very slight nod to the idea of a kimono, the silhouette and pattern shapes are predominantly Western. The set-in sleeves are just looser versions of those seen in fashionable European dress in the 180s, and the gored back panels add a slightly bustle effect to the dressing gown. 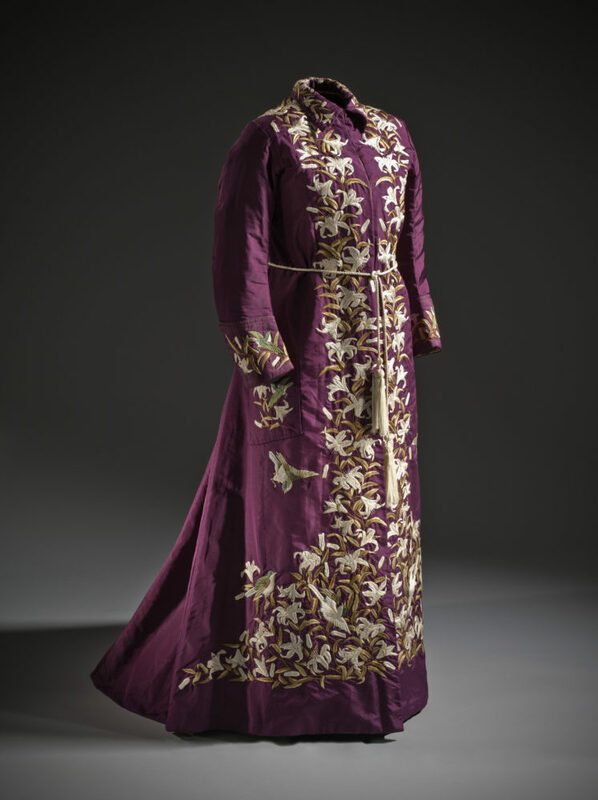 While an informal, indoor garment, this is most decidedly a dressing gown for showing off. It’s one to wear around a new husband, or to take with you when travelling, to impress the hotel maids, or to maintain your status should your host unexpectedly see you in it. What do you think? Is this the ultimate in elegantly deluxe dressing gowns, or is the mixing of aesthetics less than satisfactory? A reminder about rating – feel free to be critical if you don’t like a thing, but make sure that your comments aren’t actually insulting to those who do like a garment. Our different tastes are what make Rate the Dress so interesting. However it’s no fun when a comment implies that anyone who doesn’t agree with it, or who would wear a garment, is totally lacking in taste. The only discordant note for me is the rope belt. It interrupts the flow of the embroidery in front and looks somewhat like a dashed “cut here” line in back. Perhaps a belt of the fabric color might be less jarring. This is absolutely gorgeous! I need this to swan around my house. The colors are great, the execution of the work is excellent, I have no complaints. The color is beautiful, and the embroidery is stunning. The silhouette is a bit flat in front, but then, it is a dressing gown. I love the colour and I love the embroidery. It just scores highly all round. Sure, the back is a bit plain, but it’s still a functional garment with a key use, even if it is all gorgeous luxury, so I can’t mark it down for that. Who wouldn’t want to waft around in this? (unless it’s not their favourite colour at all). 10/10. 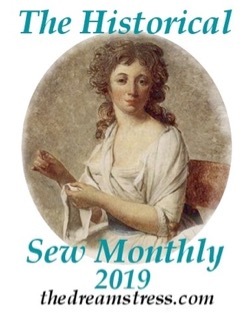 I thought I would love it from the first picture of the embroidery, but the silhouette is a bit more western than I would have liked perhaps? Not enough to knock it down too far though, they could have made a sack out of that fabric and I would still rate it! I love this! 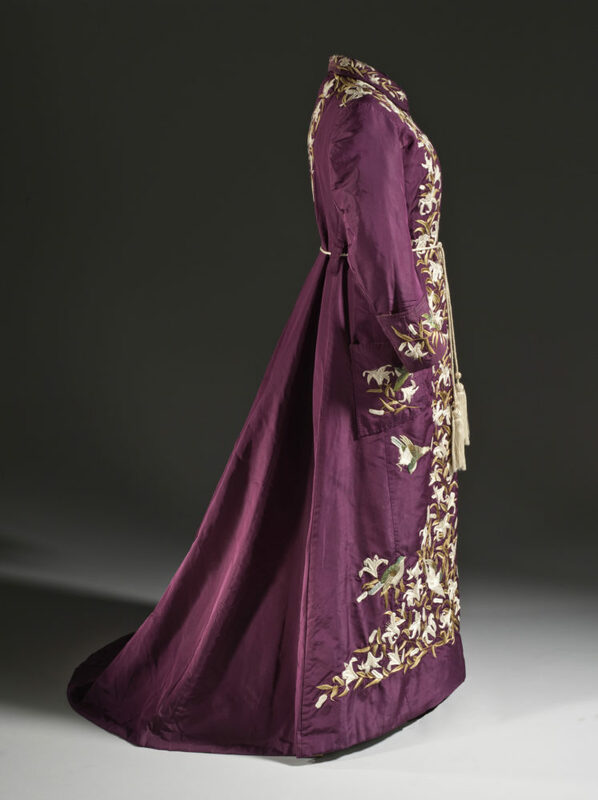 The purple is stunning and the embroidery is sumptuous. I’m taking half a point off for the belt. It’s too narrow and unimpressive for the rest of the dressing gown. Maybe it’s a substitution for the original belt. I want this to wear around my apartment, but also in front of everyone I know. I want to wear it to class, on holidays, and I want to wear it for my last cup of tea before bed. I also love when mannequins have paper hair. Very pretty! I can’t help but feel that it could have a bit more flair (maybe a more dramatic collar or be a slightly brighter purple), but it is quite lovely nonetheless. Deep sigh of longing! I am very partial to lilies, to purple, and to Japanese aesthetics. The embroidery is superlative. I do agree with the commenters above who feel the belt lacks something in compliment to the gown. If it has hidden closures, I would leave the cord off or tie it between the loops in the back. Beyond that, pure love. First, I’m glad I didn’t play last week, as my rating would have dropped the almost perfect rating. My taste may be somewhat peculiar, so I step back and remain silent when I feel a diatribe rising. On this dressing gown – SWOON!! I can find very little that is not absolute perfection! Maybe I would prefer a less high, tight, small collar. But that’s a quibble. The embroidery alone gets it to near perfection levels. The deep color of the silk is lovely. I love the obvious kimono origins, but appreciate the cut of the back as a nod to proper dress of the time. Plus, it has POCKETS! This dressing gown is exquisite. I’m not even going to deduct for the collar, as that is just a personal quibble of mine. This was a winner for me!! Belt is lacking; the collar confuses me a bit. But what a stunning frock for strutting around the house. I adore the embroidery. I love the colors. The arrangement of the embroidery on the gown is somewhat less than perfectly flattering, to my eye. Why is there a random bird flying under the patch pockets, and then another lower down? They wanted to break the smooth sweeping curve flaring out from the vertical column, clearly, but that’s a strong design element that they should have left alone! Why is there embroidery on the pockets, giving a wide-low-saddlebag effect? 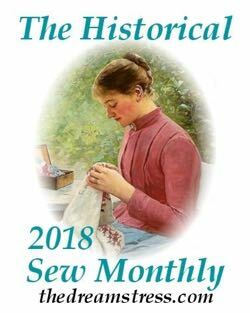 And worst of all, the rope belt instead of simply fastening down the front – a sash would have broken the vertical line of the embroidery so they were right not to have a sash, but the rope was the wrong decision imo. The rope should be on the Franciscan monks robe down the hall. Still, the robe is extraordinary, and I love it. Love it! The only quibble is that being as I am in the depths of the drab Wellington winter I feel it should be made out of something thick and velvety or at the very least, quilted. 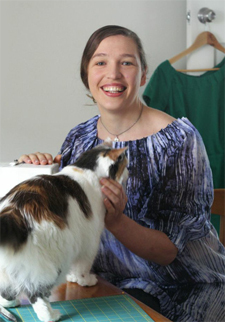 On the other hand, unlike other commenters I don’t object to the belt – it’s a classic dressing-gown belt which matches the embroidery and sends the message “this is a very flash dressing-gown not an understructured dress”. Also: pockets! Love the embroidery. The collar looks better with a head on the mannequin. Couple of small niggles about the birds between the waist and knees. I love the birds! They’re my favorite motif. Embroidery is stunning; my fingers hurt at the thought of the hours spent with a needle. Color is lovely, but was probably darker originally. The belt doesn’t bother me — I would wear it open over my lace negligee. The embroidery is splendid! If only it were not on that purple! (I know I’m bucking the trend here, and that the purple is very ‘then’, but I wish it had been black. Or dark green. Or dark blue. Fussy, aren’t I? A beautiful garment in some ways, but looks a bit chunky. Well isn’t that interesting, Yokohama is the sister city to my hometown of San Diego, CA. Can’t add anything more to what has been said in praise of this dressing gown. I’d like to order one for our daughter’s birthday next month! Her favorite color is purple and she need a new robe. This fits the bill quite nicely. The embroidery is fabulous, and the dressing gown is both practical and sumptuous. Like many others, I don’t care for the belt, especially as it distracts from the embroidery. 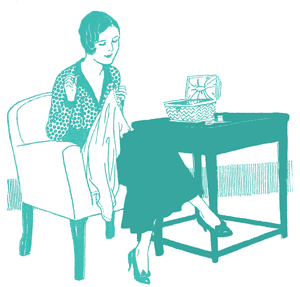 But it isn’t a built in feature that you couldn’t remove without reworking the garment. Simply take it off if you don’t like it. Therefore I’m giving no deduction for that. 10/10. kci.or.jpYou had me at the first glimpse of the embroidery! But I thought it would be European Arts and Crafts. It’s a wonderful specimen of the cultural mish-mash (Japonisme) that was happening in fashion and art after Japan came out of isolation. I would happily stumble into the breakfast room in that and be served kippers and toast. Looking at the belt loop size versus that skinny tie, I think the belt went missing and was replaced by the cord. Recycling obi and kimono was popular. This is one of my favorites – someone seems to have used an entire uchikake for it. 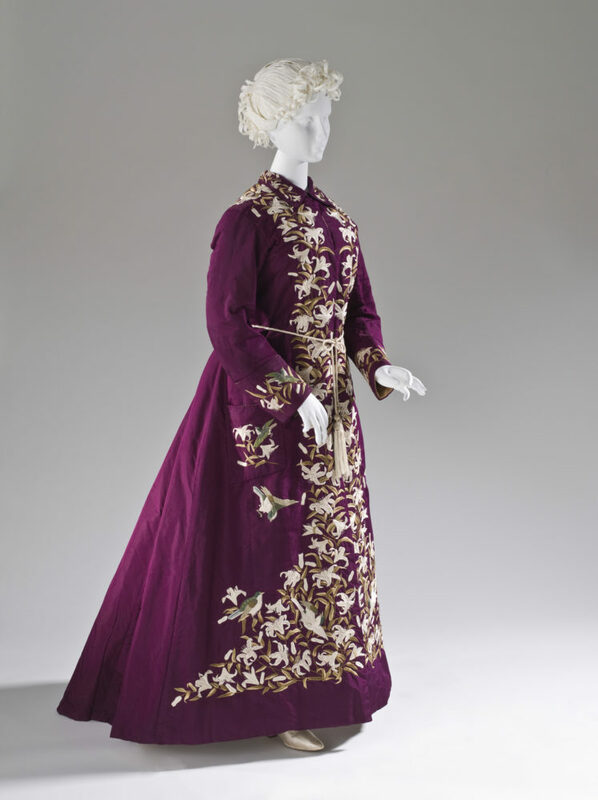 Very stately, gorgeous embroidery and color scheme. I’d wear it. This one’s pretty gorgeous but the silhouette spoils it somewhat for me, especially the way the back pokes out. If it were more streamlined I’d like it a lot more. Like most other people I also dislike the belt. The embroidery and the colours are lovely though.